Student leader hopefuls debated in front of an empty room last week, where Student Government Association (SGA) Executive Vice President, Speaker of the Senate and Presidential candidates, along with senators, debated on their stances. As expected, student involvement was a major issue brought up during the debates. Other issues included campus carry, transportation, transparency and environmental initiatives around campus. First up was Speaker of the Senate, Fatoumata Barry and Jessica Siemer. Both Barry and Siemer agreed that communication was key, both in getting information to and from students, as well as staying in touch within SGA. And that same communication point is what EVP candidate Anthony Jones focused on during his big night. A point that his opponent, Ayesha Iqbal aso addressed. The President of SGA is the most important position because the representative will regularly meet with university administration to advocate for students. It follows that this debate had the greatest student turnout. The three students running for president are Franklin Patterson, Sai Maddali, and Terry Fye. Hot topics between the three candidates were student involvement as well as SGA accountability. Dunwoody student Fye and former Perimeter College student Patterson both followed Maddali’s promise. Patterson used his experience at the Clarkston campus to incorporate Perimeter students into his platform and explain how his experience at both PC and Downtown will allow him to help bridge the gaps between the different student bodies. As for Fye, accountability, he said, has been his priority in the past as well. The second and final day of debates included SGA senator hopefuls, running to represent each of the colleges at Georgia State. SGA senators represent their individual colleges and vote of policies to present to university administration. They play a very important role in SGA, yet only 11 people showed up to the debate, and even from the ones on the roster, many didn’t show up. 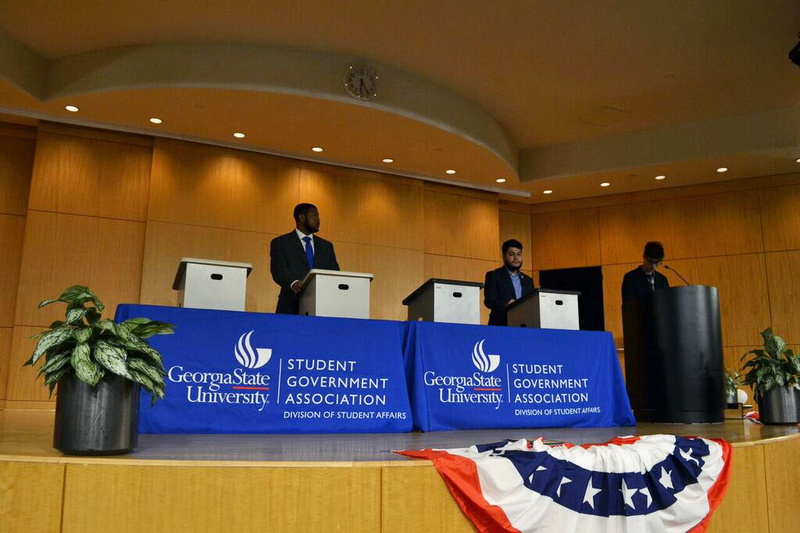 You can find the full live coverage of the SGA debates at georgiastatesignal.com/live.